Over the last couple of weeks I have been working on a new MapInfo Professional tool called Window Manager, it is nothing big but I find it very handy. 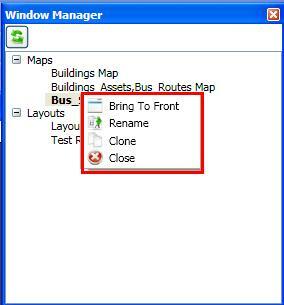 The window manager shows all the open map and layout windows in a visual WPF tree view control and gives the users quick access to basic functions when dealing with windows in MapInfo eg Rename and Clone etc. The current version (0.5) is only really a preview version and still has a little bit of work to make it a bit more polished looking, however I have tested the clone, close,rename and bring to front commands a lot as I use this tool all the time and it feels stable. I am releasing it early rather than waiting for a couple of more weeks for a couple of reasons 1) Fear of forgetting to release it due to being busy 2) Would like to see what other people would like to do with a tool like this. This tool uses WPF and in doing so needs .Net 3.5, must people should have this so it shouldn’t be a big deal. If you find any bugs or would like to see something added please let me know by commenting on this blog post, on the wiki page or on the issue tracker on my Google code page. Next Post Unofficial MapInfo feature request list – Updated Again!